Since 1920, Garfield “Gar” Wood had held the Harmsworth Trophy. Conceived of by British newspaper magnate Alfred Harmsworth, the Trophy was awarded to the winner of an international motorboat race. Wood had won the race each of the six times it was held from 1920 to 1930. But for the 1931 race, held on the Detroit River in Michigan, he was not certain about his chances. The 1,113 cu in (18.25 L) Miller V-16 engine complete with Schwitzer-Cummins Roots-type superchargers and Miller carburetors. Note the large, single exhaust manifold. The twin Rolls-Royce R-powered Miss England II would be representing Britain in the race. The Rolls-Royce R engine was developed for the Schneider Trophy seaplane race and brought the British victory in the 1929 race (and later the 1931 race). In 1930, two 1,800 hp (1,342 kW) Rolls-Royce R engines were installed in a new boat, the Miss England II, for an attempt on the world water speed record. On 13 June 1930, Henry Segrave drove Miss England II to a new speed record of 98.76 mph (158.94 km/h) on Lake Windermere, beating the record set by Wood. Tragically, the boat capsized on a third run, and Segrave died from his injuries shortly after. On 20 March 1931, Wood regained the speed record by being the first to break the 100 mph (160 km/h) mark. He ran 102.256 mph (164.565 km/h) in his twin Packard V-12-powereded Miss America IX speedboat. But Miss England II had been recovered and repaired. On 2 April 1931, Kaye Don (Kaye Donsky) drove Miss England II to a new record at 103.49 mph (166.55 km/h). Don, possessing what was officially the world’s fastest boat, issued a challenge to Wood for the Harmsworth Trophy. 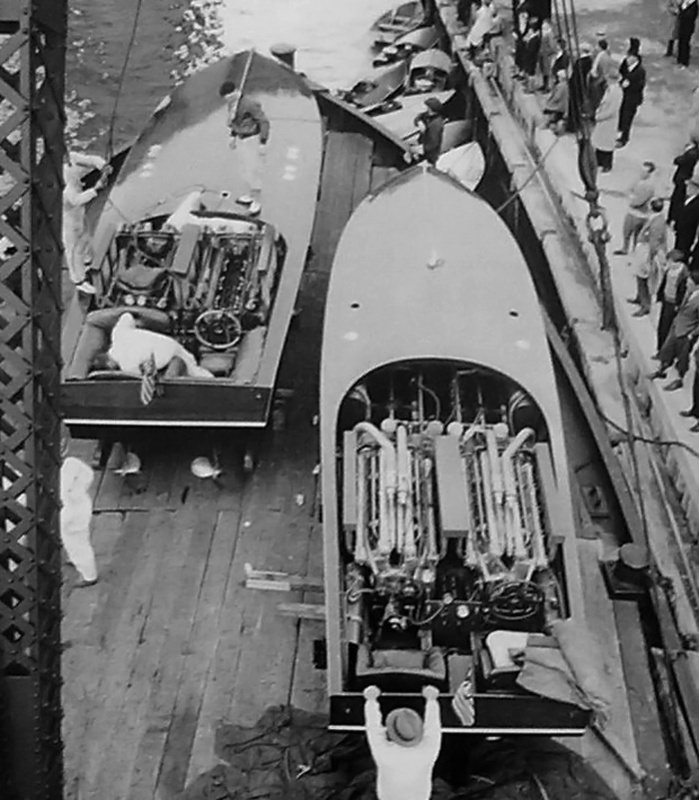 An image from October 1931 showing the Packard-powered Miss America IX on the left and the Miller-powered Miss America VIII on the right, both being prepared to launch on the Harlem River. Note that the right bank of the Miller engine is staggered behind the left bank, a necessity of the side-by-side connecting rod arrangement. Also note the mirrored supercharger/induction installation. Individual exhaust stacks were installed on the engines but are obscured by covers in the image. While at the Indianapolis 500 auto race in May 1931, Wood had a conversation with legendary engine builder Harry A. Miller. They discussed what was needed to defeat Miss England II. They decided that Wood needed more engine power to literally propel him to victory. Miller believed he had an engine design that was up to the challenge. 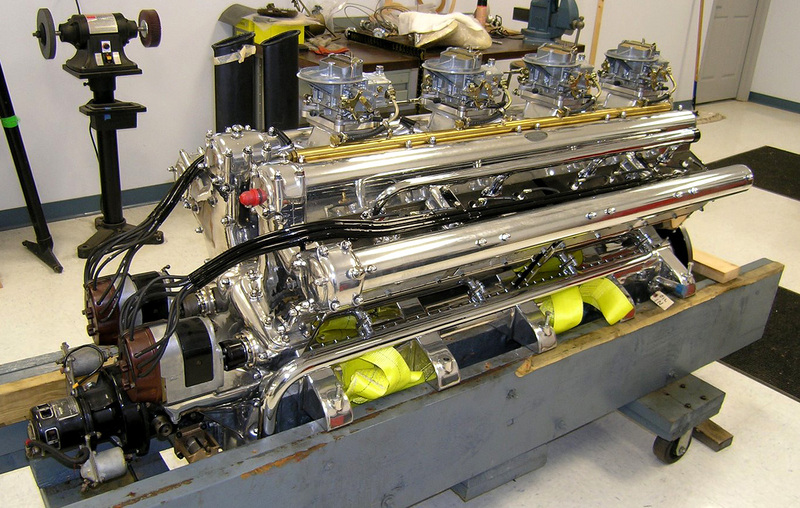 Convinced of their potential, Wood ordered two of these engines for installation in his Miss America VIII boat that currently had twin Packard 1M-2500 engines of around 1,000 hp (746 km/h). Miller and his incredible draftsman Leo Goossen went to work designing the new engine. In the meantime, Don and Miss England II raised their own record to 110.223 mph (177.387 km/h) on 9 July 1931. This necessitated the Miller engines to be further refined to produce even more power. The Harmsworth Trophy would be held in early September, so there was not much time to design, build, test, and install the engines. 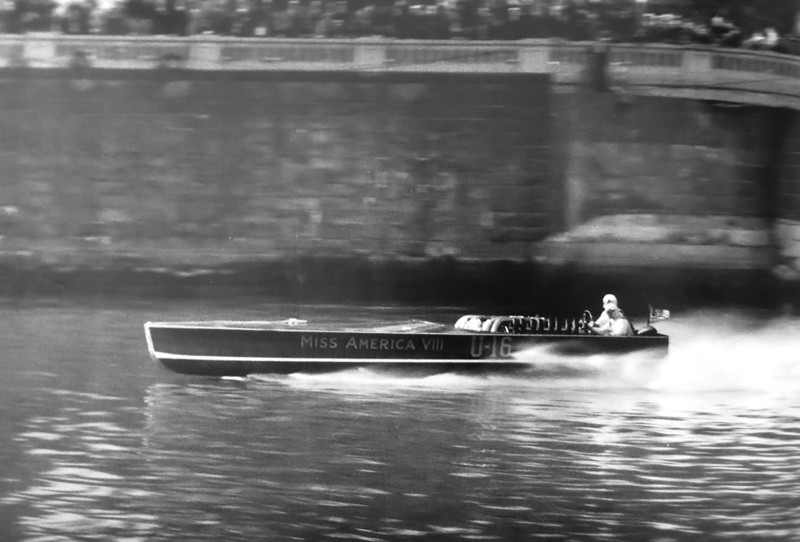 The Miller V-16-powerd Miss America VIII at speed on the Harlem River with Gar Wood as the driver on 25 October 1931. The boat would reach 104 mph (167 km/h). 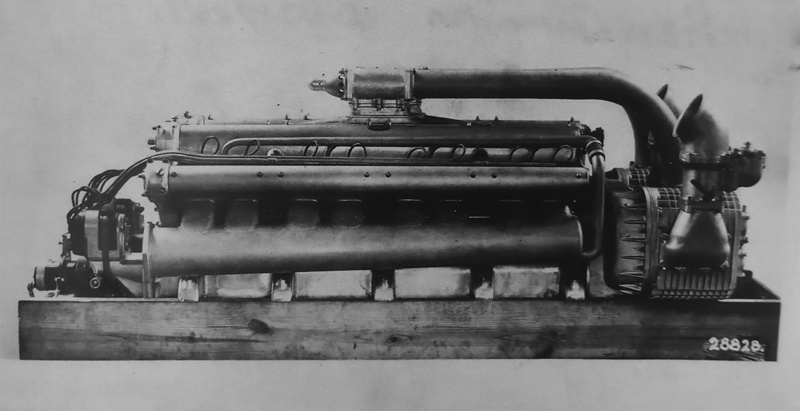 The engine Miller designed for Wood was a V-16 with 54 degrees between the two banks of eight cylinders. Two cast iron blocks of four cylinders made up each bank. The bore was 4.4375 in (112.7 mm); the stroke was 4.5 in (114.3 mm), and total displacement was 1,113.5 cu in (18.25 L). Each cylinder had two intake and two exhaust valves that were 1.6875 in (42.86 mm) in diameter. The valves were actuated by dual overhead camshafts that were geared to the crankshaft at the front of the engine. The crankcase was aluminum and supported the crankshaft through five main bearings. The one-piece crankshaft was made from a steel billet. The forged, tubular, steel connecting rods were of a side-by-side arrangement and shared a 3 in (76.2 mm) diameter crankpin. Ignition was provided by two 8-cylinder Bosch magnetos firing one spark plug per cylinder. Induction for each bank was provided by a 3 in (76.2 mm) Miller carburetor attached to a Schwitzer-Cummins Roots-type supercharger driven at .667 crankshaft speed at the rear of the engine. The superchargers provided 10 psi (.69 bar) boost that allowed the engine to produce 1,325 hp (988 kW) at 4,000 rpm and 1,800 hp (1,342 kW) at 6,000 rpm. The V-16 was 90 in (2.29 m) long, which included 18.5 in (.47 m) for the superchargers. The engine was 28 in (.71 m) wide, or 35 in (.89 m) including the superchargers and their carburetors. Its height was 24.25 in (.62 m), and the engine weighed only 1,625 lb (737 kg). On 25 August, the first engine ran for the first time, just 10 days before the scheduled race. Everything went well, but there certainly was not much time to get the engines ready and installed by the first heat race scheduled for 5 September. Reportedly, on further running, the engines had trouble reaching 6,000 rpm and would not run at more than 4,200 rpm. However, one engine was damaged during a test run, resulting in them not being ready for the Harmsworth Race. Some sources say the damage occurred after the engines were installed in Miss America VIII. The Harmsworth Race was postponed two days due to weather, and the Packard engines were reinstalled in Miss American VIII. The event turned out to be quite strange. Wood, in Miss America IX, and Don, in Miss England II, both jumped the start of the second heat by more than five seconds and were disqualified. Both racers pressed on unaware of the disqualification. On the second turn, Miss England II capsized in the wake of Miss America IX. Wood’s brother, George Wood, went on to win the trophy at 85.86 mph (138.78 km/h) in the Packard-powered Miss America VIII. The issues with the 16-cylinder Millers were worked out, and they were reinstalled in Miss America VIII. On 25 October 1931, Gar and George Wood made a speed record attempt on the Harlem River in New York but only recorded a speed of 104 mph (167 km/h). Minus the superchargers, the 1,113 cu in (18.24 L) Miller V-16s were sold to Howard “Whitey” Hughes. The now normally aspirated V-16 engines had four carburetors and produced around 930 hp (694 kW) at 4,500 rpm. Hughes used one engine in his race boat Dukie. Eventually, the engines were sold again and passed through a few different owners. Recently, the Miller engines were reunited with the Miss America VIII hull under restoration. 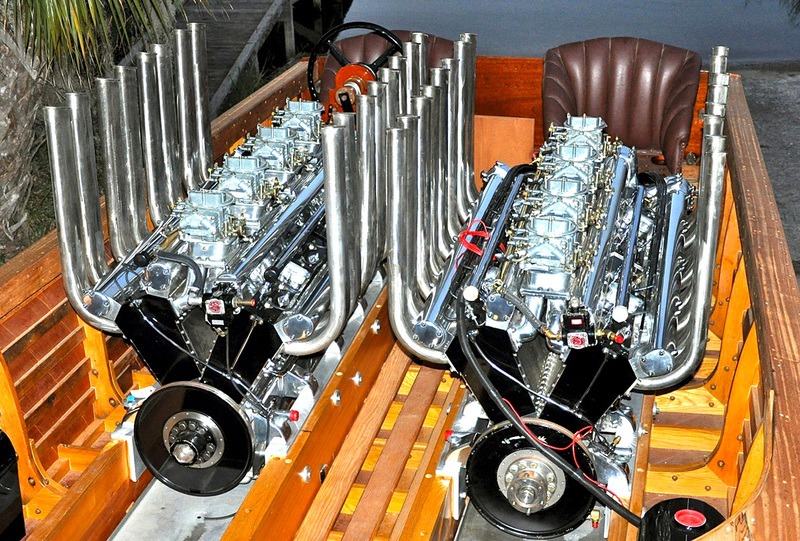 In January 2012, the partially restored Miss America VIII and the Miller V-16 engines, including the original superchargers, were offered at auction in Florida. Although the bidding got to $700,000, it did not meet the reserve price. One can only hope that this engine and boat combination will be finished and roar to life once again. 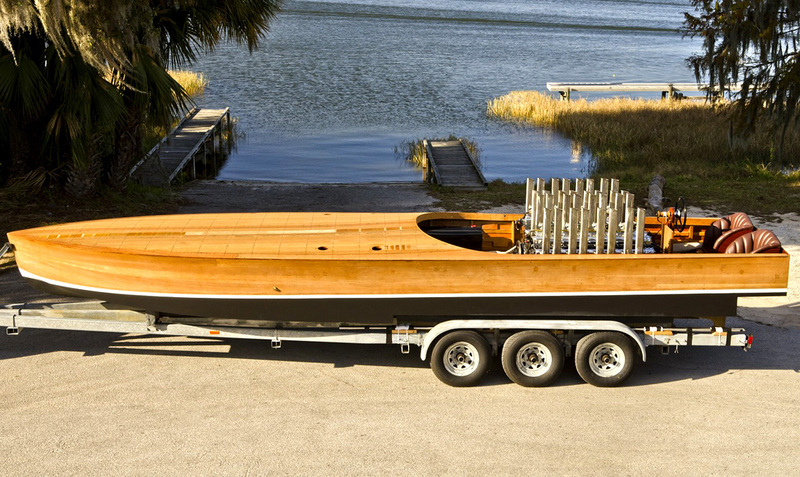 Below is a video from Mecum Auctions giving some history about the Miss America VIII boat and its Miller engines. This entry was posted in Marine on 3 September 2013 by William Pearce.